When you lift your race car to put it on scales the front wheels camber in toward the center of the car. As you let it down on the scales the wheels must be able to move back out to return to normal. If the tires (and scale pads) can’t move sideways freely they will actually keep the chassis in a slight bind and not allow it to settle out completely. This will have an effect on the weights you get and thus the accuracy of your setup. Many teams now use roll-off leveling fixtures that allow the car to roll back slightly, then forward, hopefully relieving this bind. For the most part this works well. But unless it is done several times there could still be some bind left. And you don’t really know for sure. Racers have been using scales of one sort or another for a long, long time now. Before electronic digital scale systems came along teams used mechanical grain scales. While crude by today’s standards, grain scales had one big advantage. They had rollers on the bottom that allowed the platform to move sideways, relieving any camber bind. Several companies sell “slip plates” that typically have 2 metal plates with a low friction plastic - Teflon™ or other - between. These work reasonably well, certainly better than ignoring the problem. But they are low friction, not friction free. There will likely still be a small amount of resistance and some residual bind in the chassis. The only way to eliminate this is with friction free rollers. Enter new Side Sliders™. Here all side friction has been eliminated with a series of rollers held together with metal retainers. 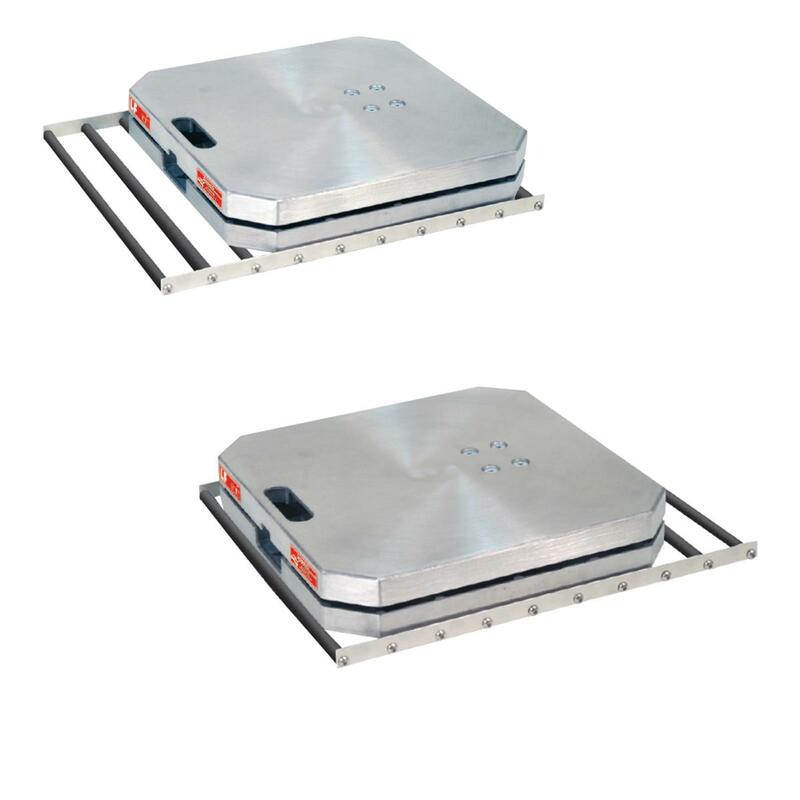 The scale pad sits on top of the rollers, allowing it to move sideways virtually friction free. As the car is lowered onto the scale pads the wheel (and pad) moves sideways to its natural unbound position. These should be used under the left front as that wheel usually has the most camber gain. Only one is needed to relieve the bind on both sides. Spacers of equal thickness are included for the other 3 corners to maintain a level setup. Getting the car on the scales bind free is not the only benefit. If you push down on the car to move the suspension you can see the scale pad on the Side Sliders™ moving sideways slightly, relieving any bind. Without Side Sliders™ the suspension would not move completely freely and any adjustments you make might not show up in the wheel weights exactly as you intended. Get the most out of your scales system by making them truly bind free. These Side Sliders™ will work on any scale pads with very smooth or machined bottoms and a smooth floor. Could be the old timers that swore by grain scales knew something after all.